Why is laser hair removal gaining so much attention? If regular waxing, shaving or tweezing makes you feel like you have been wasting a lot of your precious time then, consider getting a permanent solution to zap away those unsightly hair once and for all. Yes, if you really want to say goodbye to unwanted body hair, laser hair removal is an option worth spending your money on. Statistical reports show that Laser Hair Reduction is the most commonly performed cosmetic procedure worldwide. Millions of people have not only tried the treatment but have come out and about successfully. Most of the skin specialists prefer the term Laser hair reduction instead of Laser hair removal. Don’t get confused! Laser does remove the hair on the target area and one can expect smooth, hair free skin. However, it is important to understand that the growth of new hair is possible which can be due to several factors like hormonal imbalance and the presence of “stem cells” in the hair follicle which are important for reasons such as wound healing and pigment production and hence should not be completely destroyed. 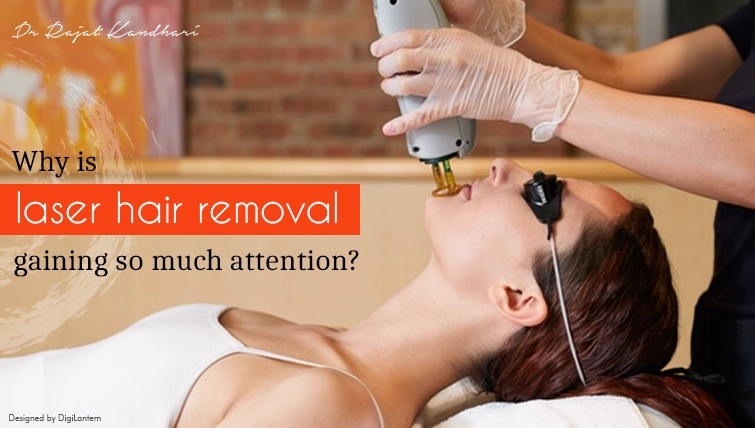 Laser hair reduction is the process of removing hair by exposing the skin to pulses of laser light that heats the hair follicles, which helps in thinning the hair down (waxing, threading and plucking on the other hand will only thicken the hair) and also decrease the density of the hair substantially, thereby providing long hair free periods. One would require visiting the clinic and getting thoroughly examined in order to understand the complete process but the good news is that the problem (read: hair) is eradicated right from the root. The goal is to make the hair follicle “dormant” so that hair does not grow on that particular area again. • Quick and Optimal Results:– The process is not very time-consuming, smaller areas like upper lips take a minute or less while large areas like legs require an hour or so. You will find a remarkable difference in three to seven sessions. • Affects Targeted Areas:- Laser hair removal treatment is extremely safe and focussed. The laser only targets the dark and coarse skin, keeping the surrounding area untouched. removal treatment is a permanent procedure. In the future, there would be no more salon expenditure at all. tasks. They may also suffer from ingrown hair, which is again annoying. Laser treatment is the best-fit solution here. underarms, bikini area, face, legs, back, chest etc. • Ready for Any Occasion:- You may have to go for a party or have a presentation with the client just after an equally busy day. With laser hair removal treatment done you don’t have to worry about getting your legs or hands waxed every time there’s a special or a formal occasion. Several types of lasers are used for hair removal process depending on your skin or the texture of hair. You need to consult the top dermatologist to make this procedure a success. We are here to help you. Log on to www.drkandhariclinic.com and book an appointment at the time that suits you. The clinic uses advanced technology and is known for unbelievably high success rate.